In what scientists will doubtlessly (and breathlessly) refer to as Dominic’s Icy Precipitate Postulate of ‘09, I postulate the following. 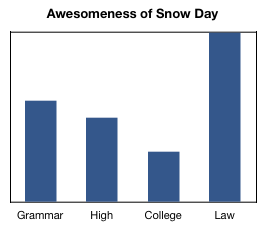 The awesomeness of a snow day is directly proportional to how much you expect it to happen. For instance, as a wee child, you expect the heavens to issue a salvo of powdery white “Get Out of Doing Homework Free” cards upon command. I mean, you begged and pleaded for those Teenage Mutant Ninja Turtles action figures, and that worked, right? It has to work for some snow: snow is free! As you get older, this phenomenon eventually tapers off, as you’ve realized how badly you want something has little to no bearing on whether it happens: at least with regard to snowman DNA. Eventually, you get to college in Buffalo, only to find out it doesn’t snow there nearly as much as you’d heard. Look upon my works, ye employed, and despair! I am nerd of nerds!